Hey, at least it's not made of macaroni. I don’t know about you, but I always feel bad getting rid of my son’s art. Sure, I could just scan it all and save it digitally (no paper clutter! ), but why not turn it into something I can wear and look at all the time? 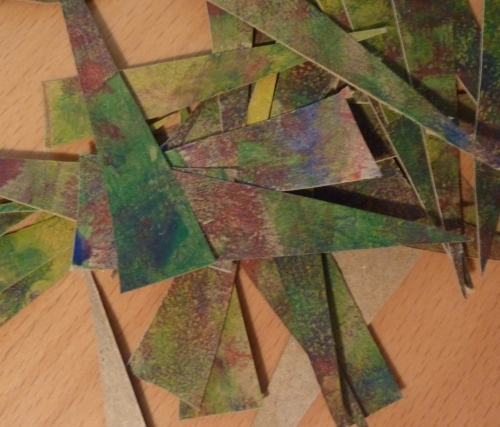 He’s not even two yet, so his art projects are still very…abstract. In other words, perfect for turning into jewelry. His latest masterpiece was a fingerpainting we made on the paper that forms a tube inside cheap wrapping paper rolls. It’s really thick, so it didn’t bleed through, and I just love finding another use for something we would otherwise just recycle. After it was thoroughly dried, I cut it into little triangles with a craft knife. The triangles were about 3 inches long, but you don’t need to be too perfect when you cut them. I just eyeballed them all – some have thicker bases, some are longer or shorter, some are a little slanted. The width of the base will determine the width of your bead, so just cut them about as wide as you’d like your beads to be. I think it actually looks better when they’re all different, but feel free to cut them all the same for a uniform look. The next step is to roll up the paper triangles, starting at the widest point, around a skewer or other thin object. 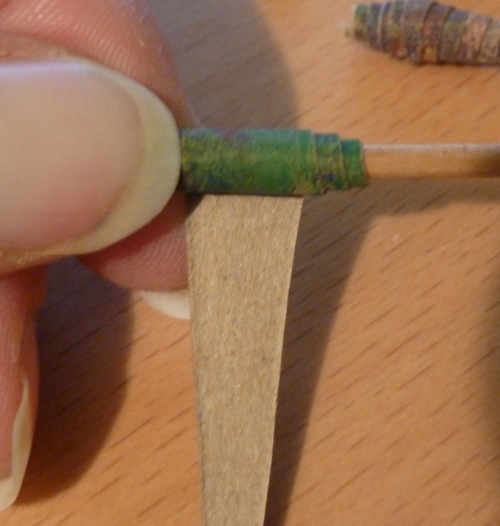 Roll it very tightly, and use a dot of glue (I used superglue because it dries so quickly) to affix the point. Paint on some Mod Podge gloss for a nice, shiny finish. Let them dry on a hard surface. Voila! 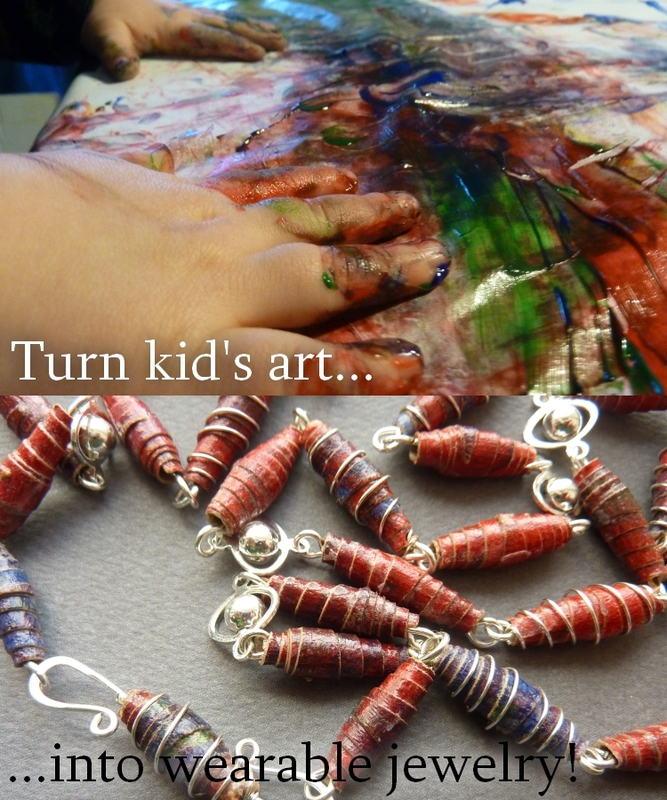 At this point, you can string your beads however you like and make a pretty nice bracelet or necklace. In the above example, I linked mine together with some simple silver wire and a few spacer beads. 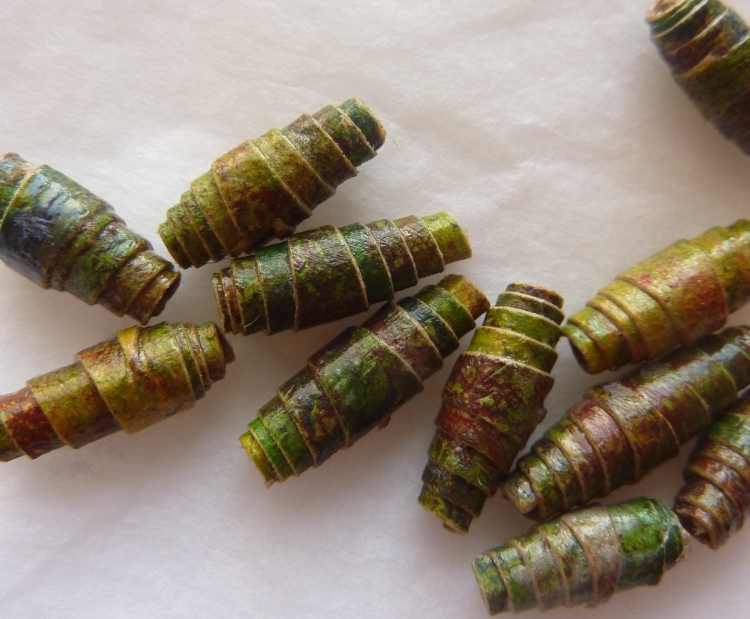 I wrapped about a third of the paper beads in 26 gauge silver wire. This would make a great mother’s day (or grandmother’s day) gift idea. Don’t have any art to work with? This method works with all kinds of paper – used calendars, wrapping paper, and torn pages from books or magazines, just to name a few. You could even upcycle extra wedding programs or invites for a special piece of jewelry! I am not afraid to say this: sometimes I am a very sweaty girl. I am afraid, however, of smelling like one. When I first read about solid perfumes, the concept blew my mind. While not new by any stretch of the mind (I’m told the ancient Egyptians used them), somehow this slipped by me. It seems so obvious! The last thing I want rolling around in my purse (or more likely these days – diaper bag) is a fragile glass grenade full of noxious, room-clearing eau de toillette. Unfortunately, finding one in person, not to mention one in my price range, proved to be a fool’s errand. Like most things in this category, I asked myself, “Can’t I make this at home?” As it turns out, yes! Not only is it potentially very cost effective (depending on your choice of ingredients), but it’s fun! I felt like an alchemist in my kitchen this afternoon, and any project that gets me out of stay-at-home-mama-mode and into magical-ancient-mad-scientist-mode is a definite win in my book. What do you need? 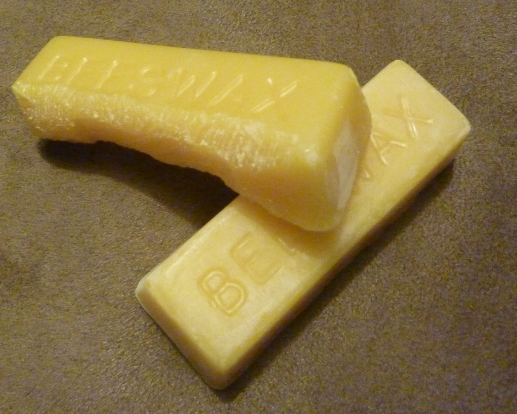 Basically, three ingredients: beeswax, a carrier oil, and a scent. A few common kitchen items. Something to put the finished product in. This is the bare minimum – you could get pretty elaborate with your recipe and setup, but that is nowhere near my area of expertise and far outside the scope of this post. The process: I don’t have a double boiler, so I set a glass bowl atop a pot with an inch of boiling water. I combined one heaping teaspoon of shaved beeswax and one teaspoon of coconut oil in the bowl, stirring with a wooden skewer until they were completely melted. At that point, I just added about 15 drops of my perfume oil and stirred. You could use any combination of essential oils or perfume oils you wanted, but I’m no expert at creating scents, so I can’t really comment any more on that. There are tons of resources available to those who are interested in perfumery! Containers can be cute, practical, or both! I wiped the water off the bottom of the bowl and poured the liquid into my containers. 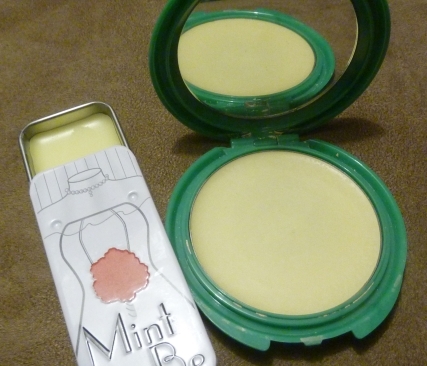 I used an old, empty compact and a tin that once held mints. You can use any small pots or tins you might have lying around, as long as they are airtight and won’t melt when you pour the liquid in. You can even use empty lip balm containers for a super convenient twist-up stick! These containers are all available new, and often in bulk, at many online retailers – just do a quick search. The perfume will set pretty quickly and will be ready to go in less than an hour. Despite the plethora of existing tutorials on creating solid perfumes, I couldn’t find much about using existing perfumes to get them into solid form, so I decided to just try it for myself. Since perfumes contain alcohol, I wasn’t sure if the oils would react strangely. I am happy to say that it seems to work just fine. I sprayed about 6 or so spritzes into the bowl (duh, make sure it’s away from the stove, especially if you use gas!) and stirred it in. It really stunk up the kitchen for awhile (maybe I should have used a perfume my husband likes?) and I suspect the finished product will be less intense than the original, but that’s fine by me since I find most perfumes to be overwhelming! I don’t know how it’ll last in the long run, but it was definitely worth trying. Even if I have to make it again in a year, the process is so quick and painless that it’s really worth it. 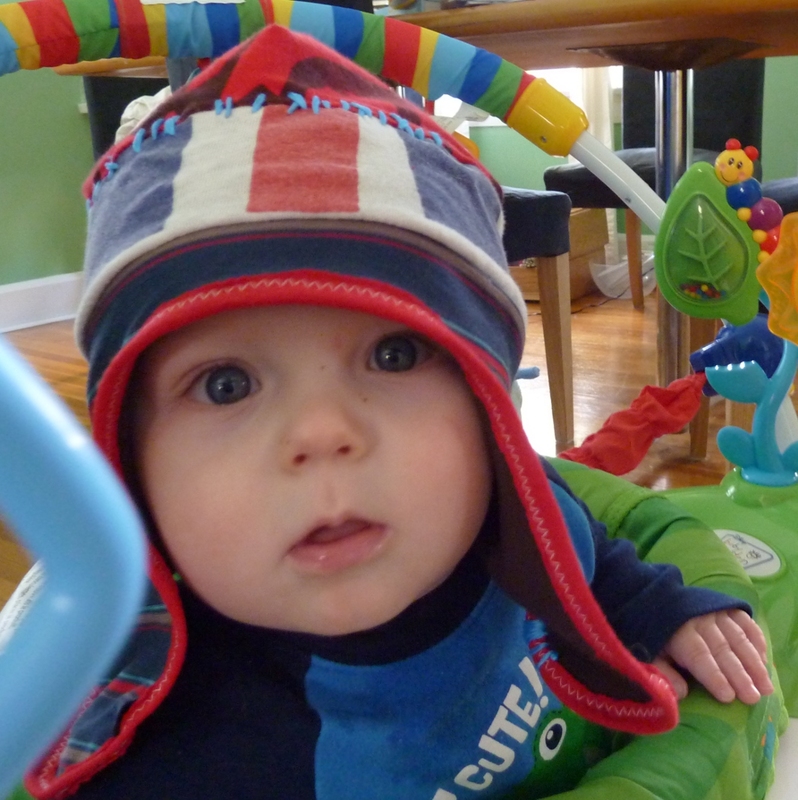 It looks adorable, when he keeps it on! Upcycled hats– These adorable hats are made with old t-shirts. I even ended up making one for my husband, and lined it in fleece (though I haven’t seen him wear it yet!) Here’s my son in one. Upcycled wool soakers (waterproof covers to go over cloth diapers)- I made several kinds, and they all work great. Just be sure to use totally natural wool – the cashmere soakers and longies I made are super soft, and the merino wool and lambswool soakers are very absorbent. This is a great use for sweaters that were accidentally tossed in the dryer. You can also find cheap ones at thrift stores – some small holes are okay, if you can cut around them. Be sure to lanolize them before you use them! Here are two different tutorials: longies, and shorties. A big list of boy’s clothes – I haven’t gotten around to making any of these yet, but several of these are on my to-do list!